Conducted by David Robertson, with Orli Shaham, piano. At the Lobero Theatre, Saturday, June 30. 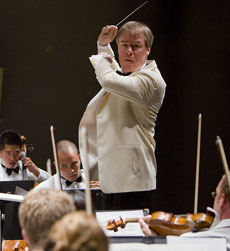 Maestro David Robertson's performance was outstanding. The radiant smiles that broke out in the violin section during the third movement of John Adams’s piano concerto Century Rolls said it all. 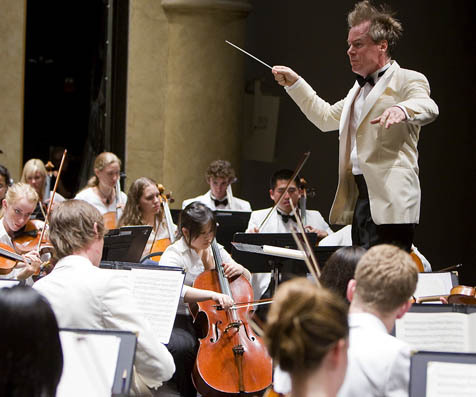 David Robertson and Orli Shaham delivered everything a young musician could hope for in a conductor and a soloist, respectively, as they led a rousing first orchestra concert of the academy season at the Lobero. The program was challenging without being off-putting, and Maestro Robertson prefaced both pieces with shining examples of the art of the introduction. The short speech he made before Carl Nielsen’s Symphony No. 5 was really wonderful-musically oriented, historically aware, and philosophically weighty, yet perfectly engaging and easy to follow. Robertson revealed Nielsen’s 1922 composition as a complex emotional and intellectual response to the demoralizing experiences of fascism and trench warfare. Characterizing the insistent snare drum as the call of fascism, he implied that Nielsen foresaw the failure of the Treaty of Versailles and the return of total war in 1940. Orli Shaham played Century Rolls by John Adams. The performance itself was dazzling. Technical aspects were perhaps less perfectly realized than on a typical recording, but one must accept this excellent student orchestra on its own terms. And on those terms the Nielsen in particular was very, very good. Robertson conducts as though his life depends on it, yet his urgency is never forced, and his podium acrobatics never devolve into showboating. His gestures are as clear and direct as his speech, and his sense of time is truly spectacular. These virtues combined allow him to achieve absolute intelligibility. Surely this is modern conducting as it ought to be, and the audience knew it, responding warmly to both pieces. The Adams concerto received the most enthusiastic standing ovation I have heard in Santa Barbara for a classical work by a living composer. 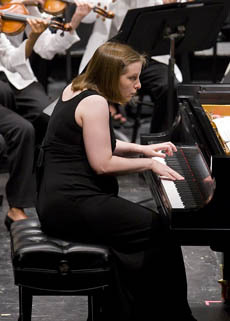 The pianist, Orli Shaham, was called back twice. It was a shame more people did not stick around to hear the Nielsen, which was the highlight. The piece twists and turns and shimmies like Ravel at his slinkiest, then up and grabs you by the throat, Beethoven-style. As Robertson mentioned in his introduction, Nielsen didn’t leave this one simply titled “Fifth Symphony” for nothing.